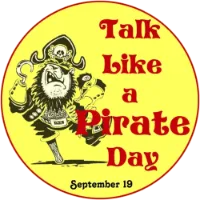 The International Talk Like A Pirate Day began not back in the Golden Age of Pirates in days of yore but in 2002. Celebrated each year on September 19, though it started in the United States, it is now celebrated internationally across the Seven Seas. The legend goes that its origin was June 6, 1995, during a racquetball game between John Baur and Mark Summers, when Pirate expletives were uttered following an injury. But because this is the observance of D-Day, the date was set instead for September 19, the birthday of the ex-wife of one of the two founders. It was celebrated in relative obscurity by John, Mark and their friends until one fateful day. In 2002, the American humor writer and Pulitzer Prize winner Dave Barry wrote a newspaper article about it and promoted the idea. The rest, as they say, is history. Unlike some of the newer Geek Holidays — like Pi Day, Foursquare Day, or Towel Day — this holiday has gained traction among a larger audience with growing media coverage, books, T-shirts, merch, and other booty. The trademark has been non-restricted, and is more what you’d call a “guideline” than an actual rule. The fact that Hermione Granger’s birthday in the Harry Potter books is on September 19 contributes to the fact that this parody holiday has gone viral. Talking like a pirate is commonly credited to the British actor Robert Newton, from his depiction of Long John Silver in the Disney’s 1950 first live-action feature film Treasure Island. His kind of quasi-Cornish accent — pirates frequented Penzance in Cornwall, England — became popular with subsequent actors who portrayed pirates in film, television, theatre, and radio. The modern holiday is related on the official site here. There’s even a Facebook Page about it here. Why couldn’t the Pirate graduate from 1st grade? To help you in your attempt to Talk Like a Pirate there is an English-to-Pirate translator here. Bill Petro, your swashbuckling neighborhood historian, me hearty!